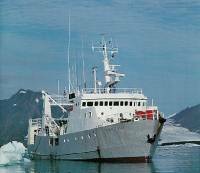 The R/V «Johan Ruud» was built in 1976 at Sterkoder Mekaniske Verksted Ltd., Kristiansund (Norway) as a stern trawler for multipurpose research activities (fishery and marine biological, geological and oceanographic surveys) in open waters along the coastline and fjord areas. The range of investigations include fish resource assessments, hydrographic and trawl surveys, geological bottom sediment sampling and acoustic registrations of the sediment layers below the sea-bed. Shrimp/fish stock assessments Geological investigations (bottom cores, echo-sounding, acoustic surveying) Plankton surveys, Fishing gear trials and underwater surveys, Marine mammal surveys Naval training courses. Most research activities will be carried out along the coast and in the fjords from Lofoten islands to NE Finnmark and the SW Barents Sea. Main engine Wickmann 4 AX 1000 Bhp at 375 rpm.